When Did Your Love Affair With Horse Racing Start? When was the first time you caught the bug and knew that horse racing was going to be your thing? Was it the 1973 Belmont Stakes when Secretariat romped to a 31-length win that still gives many goose bumps? Was it when jockey Jean Cruget stood up in the saddle right before the finish line at the 1977 Belmont Stakes to make sure we all knew how dominant Seattle Slew was in his Triple Crown conquest? I just turned 50, so, now, I can proudly say that “I’ve been around.” My sports memory goes back to age 8, which was in 1976. I can vividly remember most sporting events from that year going forward. I remember Slew winning the 1977 Triple Crown, against horses like Run Dusty Run and Bob’s Dusty. I have always loved sports. My dad used to work nights when I was in my formative years and my mom and I had a deal that, if there was an elimination game, young Johnny Furgele could stay up a little later to watch. When the Cincinnati Reds won game four of the 1976 World Series, I was downstairs in our basement watching. The game ended right before 11 p.m. and mom was hosting a Tupperware party (or something like that). When I came up to say goodnight, one of her friends expressed surprise that I was still awake. 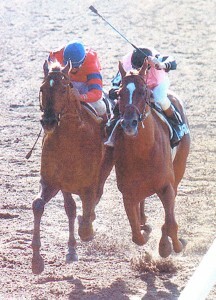 Affirmed (right) won the Triple Crown — Kentucky Derby, Preakness Stakes, Belmont Stakes — in 1978. For me, 1978 made me a horse racing fan. As most folks know, winning horse racing’s Triple Crown is not that easy. After Citation did it in 1948, there was a 25-year drought. Then, Secretariat did it in 1973 and, four years later, so, too, did Seattle Slew. As a 10-year old kid, I was thinking that this really isn’t that hard. The 1978 Triple Crown was really three match races. There were two studs in Alydar and Affirmed and most would say that Alydar was the more talented colt, but Affirmed was the one with the bigger heart and greater determination. I grew up in the Buffalo suburbs and root for Buffalo sports teams. In the 1970s, we had the Buffalo Bills, Buffalo Sabres and — you might need Google for this — the Buffalo Braves in the NBA (they’re now the LA Clippers). Of course, none of the teams won a championship and it has been 99 seasons combined without a title for the Bills and Sabres. The reason I say this is because I have Buffalo DNA — I’m drawn to teams and athletes that come up short. So, naturally, I rooted for Alydar in those Triple Crown races. The three races followed a familiar script. Affirmed would stalk, always near the lead, while Alydar hung back. In the stretch, Affirmed would take the lead while Alydar charged. But in the end, Affirmed, ridden by a young Steve Cauthen, would prevail. Their clash in the Belmont is when I got hooked for good. They went through three-quarters in 1:14 and change and, because it’s the Belmont, the race was only half-over, meaning these two would go mano a mano for another half-mile (one minute and 12 seconds). It was a stirring stretch drive and, when Alydar took a brief lead, I got excited. But Affirmed did what he always did, he dug in and found another gear to get the win, giving the 1970s its third Triple Crown winner. When you’re 10 and have no bills to pay and no real cares in the world, you take things like sports a little too seriously. I remember my Dad saying that I should be happy because we just saw a horse win another Triple Crown. Forty years later, I understood just how right he was. My Dad was a big sports fan; he was “The Mentor”. He had tremendous knowledge of history, could recite obscure facts and he passed those traits on to me. We would go at it at the dinner table, drawing many eye rolls from mom and my younger sister. When the Buffalo Evening News (yes, there were evening newspapers back then), came, it was a battle, because whoever got it first was going to take the sports page for a good 30 to 45 minutes. The one Derby that really stands out is 1984, not because Swale triumphed, but because of what my father and I were doing that day. I had turned 16 that March and was practicing for my upcoming road test for my driver’s license. We were driving in Niagara Falls on the first Saturday in May; me behind the wheel and my father pretending to be calm on the outside, while fighting ulcers on the inside. I was struggling and with the test coming up in three days; the situation was bleak. We were on a side street and my dad instructed me to parallel park between two Cadillacs. I was nervous, but if you’re going to drive, parallel parking is a necessary evil. I tapped the one in front of me and then tapped the one behind me. Thankfully, back then, cars had more steel and were built more like tanks. All three cars escaped unscathed and I looked at my dad with a “what next?” look. I was expecting to get yelled at, lectured to and scolded. Instead, my dad, always calm in these types of moments, looked at his watch and told me to go to the light, take a left and then a right and then another left. 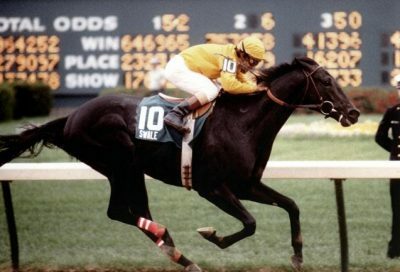 A son of the great Seattle Slew, Swale won the 1984 Kentucky Derby (photo via Aiken Racing Hall of Fame). We sat at the bar, my dad downing a couple Miller High Lifes while I drank Pepsi and munched on Groff’s (Google needed again) Potato Chips. The bartender asked who we liked and, naturally, because of that Buffalo DNA, I picked Gate Dancer to win (he finished fifth). My father enjoyed his brews, knowing that he had a driver — although not a good one — at his side. Swale’s win was not an upset, but three days later, a true upset occurred when a young, bad driver named Johnny Furgele passed his road test. You needed an 80 to pass; I got an 84 and, of course, the year was 1984. All was right in the world. I ask my kids watch the Kentucky Derby and have a fun little handicapping contest to entice them. I know they don’t love horse racing like I did when I was their age, but they never met my father (he passed in 1990, six weeks before Unbridled won the Derby), so I sell this as our link to him. Mom comes over and a good time is had by all. I hope that when they are 50, they will “encourage” their children to watch in reference to me and my father.